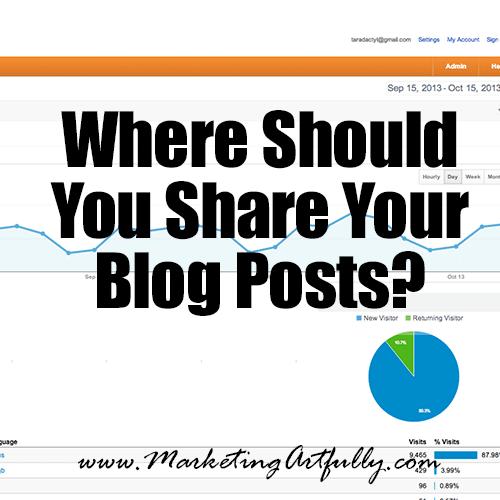 Where Should You Share Your Blog Posts? You are here: Home / Uncategorized / Where Should You Share Your Blog Posts? Today’s question comes from reader Rae Ann Dougherty of Green Cleaning Products LLC. Rae Ann asks…where should you share your blog posts in late 2013 or early 2014? She mentioned sites like Google, Facebook, Twitter, Pinterest, LinkedIn, Digg, De.i.cio.us, Stumble Upon, Technorati, Yahoo Buzz!, Blink List and Tumblr. The landscape has changed so much that it is hard to know as a business person where you should spend your time and energy! Now, this is a post about where to share your blog posts, NOT about where you should publish content, which is a whole different ball of wax and can include sites like Rebel Mouse, Medium and the like. In thinking about this, I want to break down the three types of content sharing…social sharing, search sharing and bookmarking. Social sharing sites include things like Facebook, Search sharing is on Google or the other search engines and bookmarking is less about sharing and more about making a list of relevant sites. Let’s break it down by my numbers…we are going to look at two of my sites..this one that is O-L-D and gets lots of search engine traffic and which has old share links across the web (maybe not the best example for most of my readers) and www.MandMMonsters.com which is new (under a year old) and does not have the benefit of being already indexed on lots of sites. Social sharing includes sites like Facebook, Twitter, Pinterest, and LinkedIn. I KNOW that there are myriad more but these are the ones that have the most traffic and mass of humans to be able to share and consume your stuff. (Whether you should be on tiny social networking sites is a post for another day). 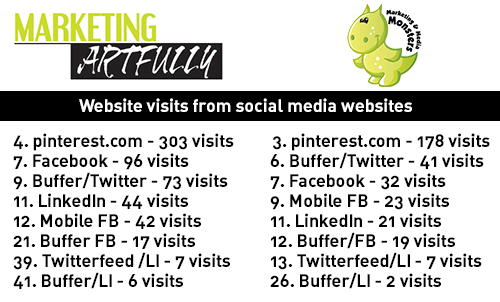 As you can see, Pinterest is overwhelmingly the top spot for sending traffic (and that is knowing that most of our stuff being B2B was not that hot on Pinterest a year ago…:) I find it awesome that using the bufferapp.com tool is actually helping our traffic. This one is a little more confusing as I do not see Google Plus broken out as a line item for Marketing Artfully as it is so integrated into Google the search engine so I am not sure if there is just no traffic from Google Plus or if it is actually just being absorbed by the Google numbers. That said, I did see three click throughs for google plus broken out on the MandMMonsters.com site. At one time, getting a front page link on Digg was a real coupe. Today Digg has faded into obscurity and no longer is the driving force it once was. There are some old sites like Digg and Reddit, some (good for me) sites like Stumbleupon and some that aren’t taking individual posts anymore like Technorati. As there is not as strong a social sharing component, I am not sure that these are as valuable as they once were BUT please note that I only really share to Stumbleupon at this point so my numbers are skewed that way. 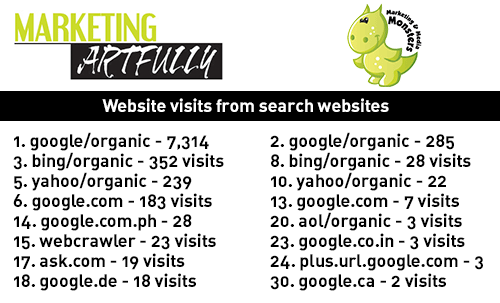 So, based on the numbers, I would say that spending time on social and increasing your search are good uses, I will continue to do stumbleupon because I find stuff there to share, but overall will not be taking any time to submit to directory sites from now on. PS – this “where should you share your blog posts” data is skewed. It is based purely on what we are doing currently and just because we are not getting traffic from some of the sites may have more to do with the fact that we are not focusing on them than the fact they wouldn’t send traffic if we didn’t do a bit more. I used the data I had at hand!